Whole wheat flour can be great to bake with, adding whole grains and a nutty flavor to a wide variety of recipes. But whole wheat flour doesn’t always deliver the same results as all purpose flour, so substituting it directly into your favorite recipe might not give you the results that you’re looking for. 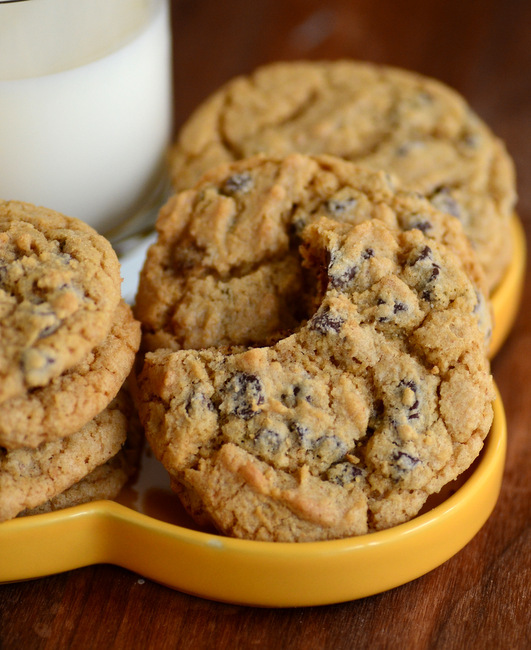 These Perfect Whole Wheat Chocolate Chip Cookies are calibrated to work perfectly with whole wheat flour as a base, resulting in cookies with just the right amount of chewiness and plenty of chocolate chips. The cookie dough is a little bit unusual in that it uses both butter and vegetable oil, along with both brown sugar and confectioners’ sugar (powdered sugar). 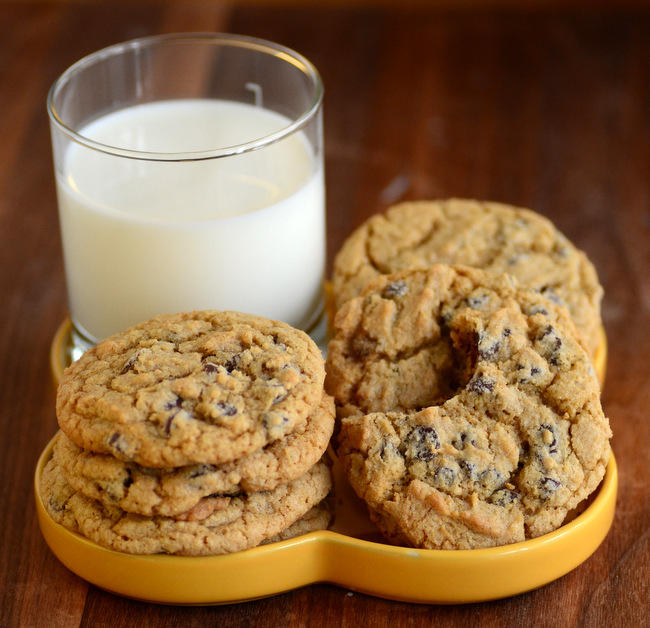 Vegetable oil tends to help baked goods retain a little bit more moisture than butter alone, preventing the cookies from being too dry – a common complaint about cookies made with whole wheat flour. Confectioners’ sugar plays a similar role, adding sweetness while helping to add additional tenderness to the cookies. Confectioners’ sugar is often used as the sweetener in shortbreads and butter cookies, where you’re looking to create a melt-in-the-mouth texture. While we’re not looking for that same type of texture in this recipe, that gives you an idea of how the confectioners’ sugar can impact the texture of a cookie recipe. The cookies are made with all whole wheat flour, but can also be made with white whole wheat flour. White whole wheat flour is made from a naturally occurring albino variety of wheat, so it has a whitish outer bran (hence the name, white whole wheat) and a milder flavor than other whole wheat flours, although it has all the nutritional benefits of other whole wheat flours. Both flours will impart a wonderfully nutty flavor to the cookies, with white whole wheat lending a slightly more subtle flavor. Both work beautifully, so use what you have on hand! These cookies come out of the oven looking just about picture-perfect. They have attractively cracked tops and are packed with chocolate chips. They use a combination of regular chocolate chips and mini chocolate chips, which gives you a great distribution of chocolate in every bite. The chocolate goes very well with the natural toastiness of the whole wheat, too. The cookies are ready to eat as soon as they have cooled (and the chocolate is still melty!!) and can be stored in an airtight container for a few days after baking. In a large bowl, cream together butter, vegetable oil, confectioners’ sugar and brown sugar. Beat in eggs, one at a time, followed by vanilla extract. Stir in flour mixture at a low speed until the dough comes together. Stir in chocolate chips. Shape into 1-inch balls and arrange on prepared baking sheet, allowing about 2-inches between cookies for spread. Bake for 10-12 minutes, or until cookies are set and very lightly browned on the outer edges. Baking longer will result in a crispier cookie. Allow cookies to cool for 3-4 minutes on the baking sheet, then transfer to a wire rack to cool completely. These cookies look so delicious and I love how easy this recipe is!